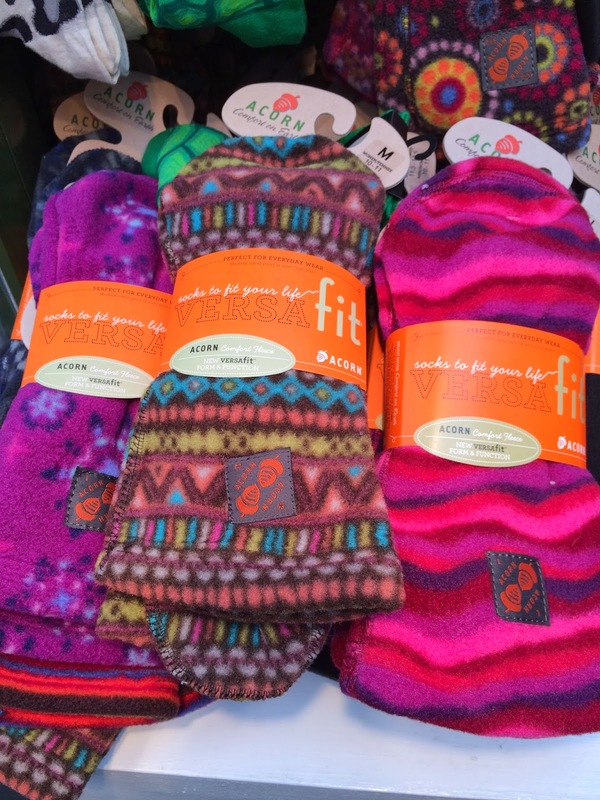 After long days of work, negotiating crowded, slush-filled streets in Midtown, and shopping furiously as the days count down to Christmas, your feet do a lot of the heavy work while receiving the least care. Why not give them some special attention? 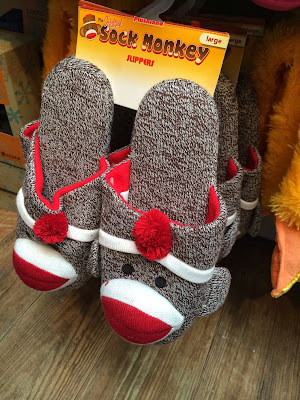 Several of the shops at Winter Village offer items that allow you to give your feet that extra pampering they deserve! 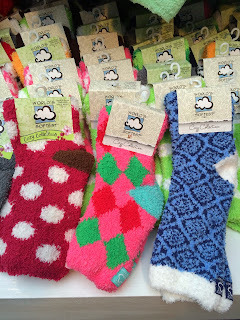 Bergies Super Socks can fill all your sock needs from wool to cotton to fleece. 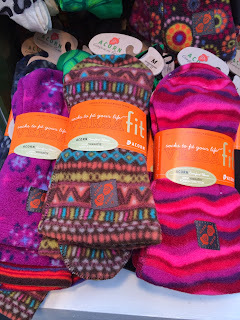 Their most popular item, The World's Softest Sock (shown above left), comes in a large range of patterns and colors, and would make great stocking stuffer or secret Santa gift. The eternally-popular Sock Monkey shows up on slippers (top) that could make a great gift for your college-aged cousin or niece. Bryant Park is one of 130 retail locations around the world for Sabon, the all-natural bath and body product favorite. Sabon doesn't disappoint when it comes to foot care; their knowledgeable sales associate, Yolanda, walked me through 4 different items specifically made to soothe some tired toes. The Foot Scrub is made with crushed almonds for polishing away the dry and calloused skin on the soles of your feet while also smelling great. Next up, the Foot Cream, that contains menthol and camphor combined with aroma-therapy oils and skin conditioners for an especially cooling, deep moisturizer for hard-working feet. There's also an Organic Foot Cream, which is a unique formula of oils and extracts that leaves the skin on our feet smooth. This Foot Cream uses organic Shea butter combined with witch hazel to soothe weathered skin. 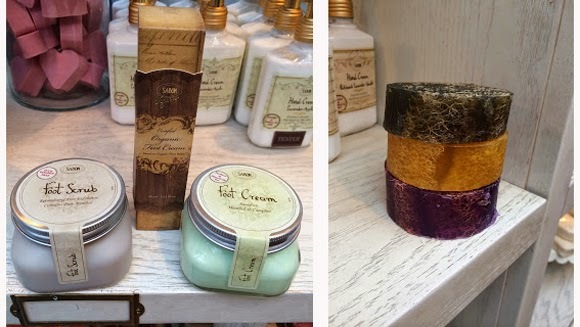 Lastly, there's the popular Loofah soap (above, right), available in Amber, Lemon or Lavender scents, that combines cleaning and exfoliation in one step. Dr. Sofskin is known for their small-batch beauty products, which are free of parabens, petroleum by-products, and artificial additives. They use organic ingredients whenever possible, and package their creams and lotions in eye-catching recyclable containers. 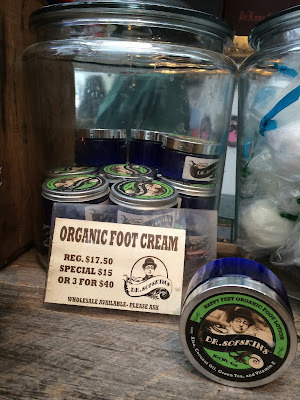 This shop doesn't disappoint on the foot care either; the thick, mint-scented Happy Feet Organic Foot Lotion with organic coconut oil, aloe, green tea, and vitamin E gives your feet a special treat. Soxeteer sells "Fun Socks for Happy Feet", and their selection at Winter Village makes good on that motto. 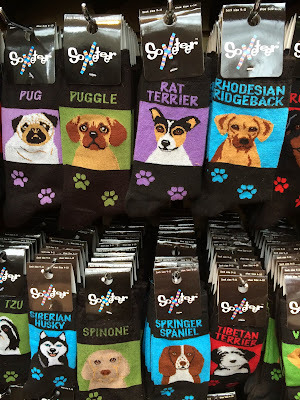 Offering novelty socks for adults and children, they carry a large selection of socks specifically targeted at your favorite pet owner or specific dog breed lover. 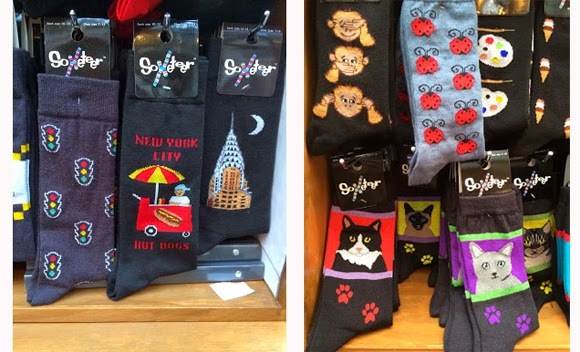 They also have stripes, polka dots, rainbows, and NYC-themed socks. Nothing can put a smile on someone's face like a fun pair of socks, so check out their inventory and see if you can find the perfect gift to dress up someone's feet this holiday season.